This is a heck of a name to say, but oh so worth it!!! These babies are RICH and go great with coffee! I got this recipe from Kitchen Daily and adapted it a bit, so check out the original as well. The riper the bananas, the better, so go for the mushy ones turning black…mmmm. The original recipe calls for oil, but I substituted applesauce and it worked wonders. You want to indulge? Go for this recipe for sure!! Enjoy! Preheat oven to 350 degrees F. Spray a muffin pan with nonstick spray or line with muffin cups. You can also make 24 mini muffins. Set aside. In a medium bowl, stir together flour, baking soda and salt. Set aside. In a large bowl, whisk together bananas, peanut butter, applesauce, egg, vanilla and brown sugar. A stand mixer can be used to beat the wet ingredients. Pour dry ingredients into wet ingredients and stir or mix until just combined. Do not over mix. Fold in chocolate chips. Scoop batter into prepared muffin pan. Fill 1/2 the way up or just under that, Drop 1 teaspoon of Nutella on top of each muffin. Spoon more batter over the Nutella, filling the cups 3/4 the way full. 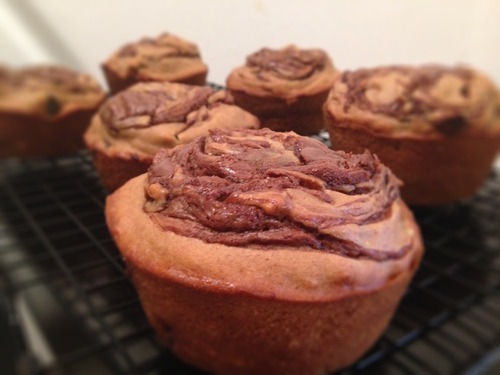 Add a teaspoon more of Nutella on top and swirl with a knife or toothpick. Do the same for mini muffins. Bake 20 to 25 minutes (10-12 for mini) or until lightly browned on top. Let them cool in the pan for 10 minutes, then loosen the edges of the muffin pan with a knife and remove, transferring muffins to a cooling rack.